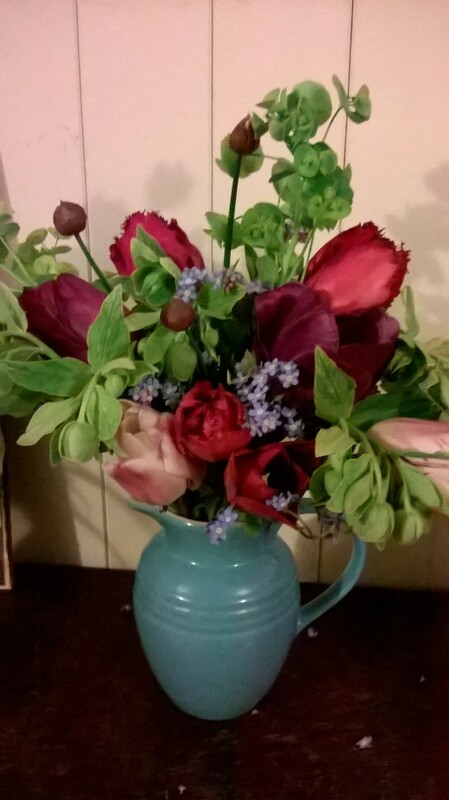 Follow my simple tips to make your jugs of flowers last for as long as possible. If possible, especially in the height of Summer, cut your flowers either early in the morning or in the early evening when the sun isn't at full strength and the rate of transpiration (water loss through the leaves) is at its lowest. Use proper flower snips or secateurs so that you don't damage the stems which will interfere with water uptake. Cutting stems at an angle will increase the available surface area for water uptake. For most flowers, pick before the flower is fully open when the petals are just emerging from the bud. Exceptions are Dahlias, Zinnias and Roses which may not develop fully from a tight bud. Carry a bucket 1/3rd full of water to your cutting patch and plunge your cut blooms in straight away to prevent water loss and wilting. 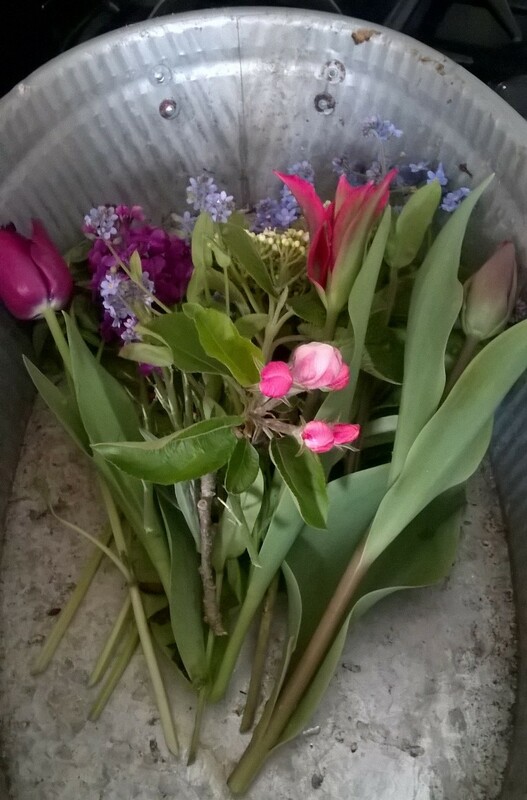 Ensure your chosen container is clean before use as a build up of bacteria will shorten the life of your flowers. Hot, soapy water is fine and I use a bottle brush to get into any hard to reach places. Some flowers need Conditioning to maximise vase life. Most benefit from spending a few hours (or overnight) in a cool place, out of direct sunlight, bathing in water up to the first flower bud. Searing the stems of soft and sappy plants such as Euphorbias, Hellebores and Poppies in boiling water will help prevent the dreaded flopping - place the bottom inch of stem in a jar of boiling water for approx 20 seconds while protecting the flower from the steam. Remove any foliage from the stem which will sit below the water line as it will decay and promote the growth of bacteria. Commercial flower food or your own mix (a tsp of sugar and a few drops of bleach or vinegar) can be added to the water to discourage bacterial growth and provide nutrients. Change or top up the water in vases regularly and if necessary, re-cut the flower stems of any flowers that have wilted as this might be enough to perk them up again. 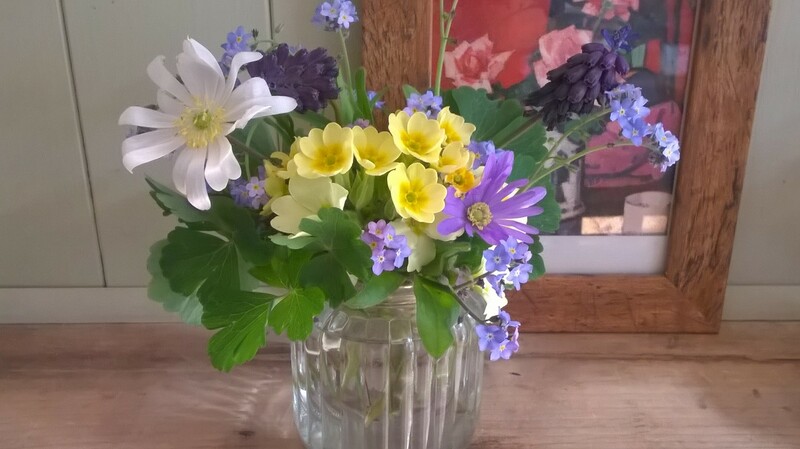 If you don't want the fuss of having to rearrange your flowers all over again, carefully push the flowers to one side and hold the vase under a gently running tap until all the old water overflows and has been replaced with new water. Keep jugs of flowers out of direct sunlight and away from heat sources such as radiators as high temperatures dramatically shorten the life of cut flowers. Some flowers and foliage are naturally long-lasting once cut such as Larkspur whereas others like Sweet peas and Cornflowers have a shorter life-span. You can edit your arrangement throughout the week - remove stems of flowers that have gone over, or snip them off if it is hard to extract them, and replace with some newly cut flowers. If your foliage is long-lasting then you can always re-cut the stems and use it in a totally new arrangement. The important thing is to have fun and if you feel like picking some flowers in the middle of the day and just plunging them into a milk bottle then don't worry - your flowers may last a day or 2 less but as you are growing your own displays for a lot less than it would cost you in a supermarket, you won't mind. It's a good excuse to pick some more! 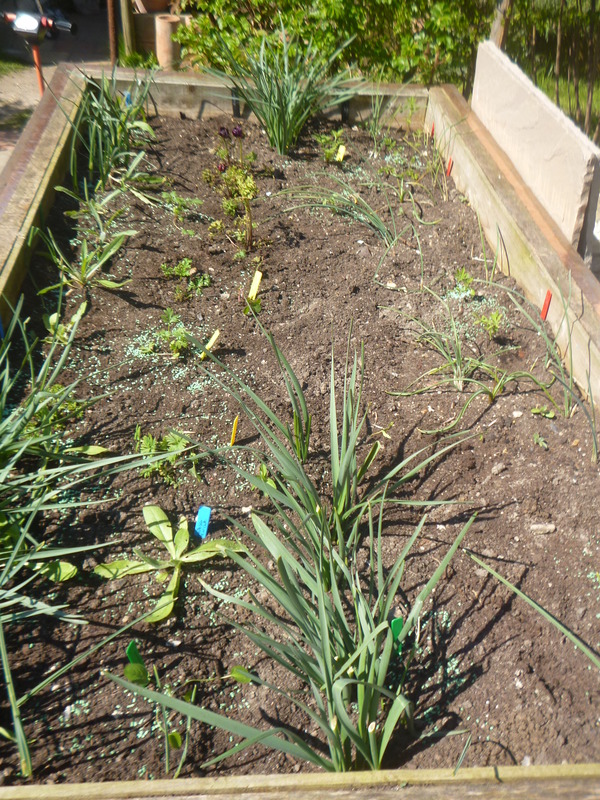 My Cutting Garden Diary - the story so far..
Raised cutting bed. Hardy annual seedlings have been planted in between daffodil foliage which has yet to die down. This will be a riot of colour in a few months time - watch this space! 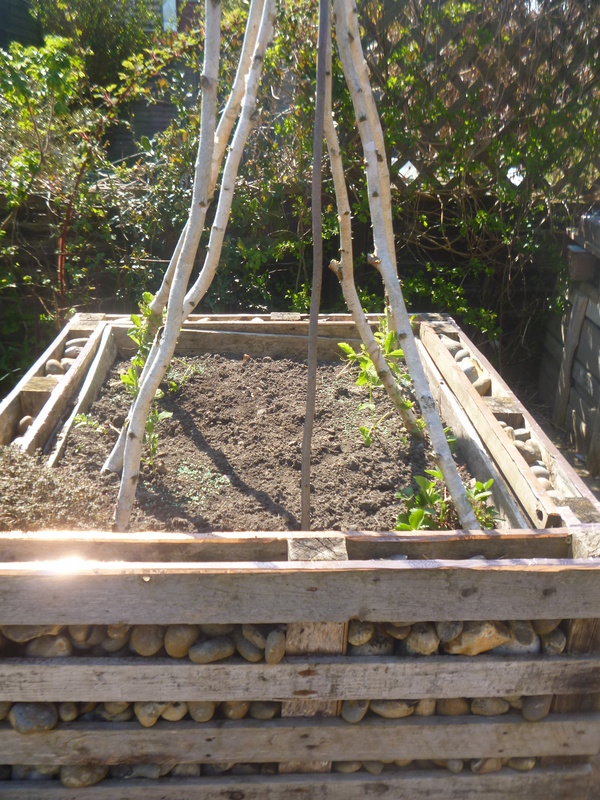 Back in late January, I sowed 3 varieties of sweet pea (‘King size Navy Blue’, ‘Purple Pimpernel’ and Matucana) which I have just planted into a bed with a wigwam frame of birch branches. These climbing annuals are one of the very first seeds you can sow in the Winter if you are itching to sow seeds ready for warmer weather. It is generally best for most hardy annuals to start sowing a little later in the year, in March, when the temperature is a bit higher, but crucially day length is longer which is what spurs these little seeds into action. Annuals (plants that go through an entire life cycle in one season - growing, flowering and setting seed) will be one of the mainstays of any cutting garden. Hardy annuals are resistant to frosts and, therefore, can be sown outside in the open ground in Spring where they are to flower, but again, you will need to wait until late March when the soil temperature is warm enough. Once you see annual weed seeds starting to germinate in the garden this is a sign that the soil is warm enough for your flower seeds. I, being really impatient to get going and a bit overexcited, sowed most of my hardy annuals in early February and have since sown a few more as a second batch in March when some failed to germinate. The second batch have nearly caught up with the first batch (probably just a week or 2 behind) so there is no real need to sow before the beginning of March. Some hardy annuals can be sown in September and overwintered in order to get a really early start. Those best suited include Cornflowers, Sweet peas and Ammi majus. Whether you sow inside in pots or seed trays, or directly into the ground, will depend on whether you have the space to raise seedlings under cover in the form of a heated greenhouse or wide window sills. I have a small potting shed, converted from an old coal shed, but it isn't heated and space is restricted but I do have lovely big window sills in the house. I sow directly into 9 inch square pots, a method also used by flower seed supplier Higgledy Garden. This size of pot is big enough for seedlings to grow to a decent size without outgrowing the pot. I sow 3 seeds per pot and then remove the 2 weaker seedlings, if they germinate, to leave one seedling per pot. This means I don't have to prick out seedlings from seed trays and pot them on. This size is also perfect for fitting into seed trays which act a reservoir for water. I can turn the whole tray round easily each day to prevent seedlings growing crookedly toward the sun and transport a tray at a time outside when it is time to harden them off (gradually accustom them to lower, outside temperatures). Use a special seed compost, which has the right balance of nutrients for early seed development and a light texture, and follow the instructions for sowing on the back of the packet. Generally, most seeds just need a light sprinkling of compost over the top of the seeds. Water the compost in the pot before sowing your seeds so that you don't wash away the seeds you have just sown and, once sown, keep the soil moist. Water with a small watering can with a fine rose so that seedlings and seeds and not dislodged. Once the seedlings have reached a fair size, I take the trays into the potting shed during the day and return them to the house at night for a few days and then move them into the potting shed permanently so that I now have space on my window sills for my half-hardy annuals which I sow in late March / April. 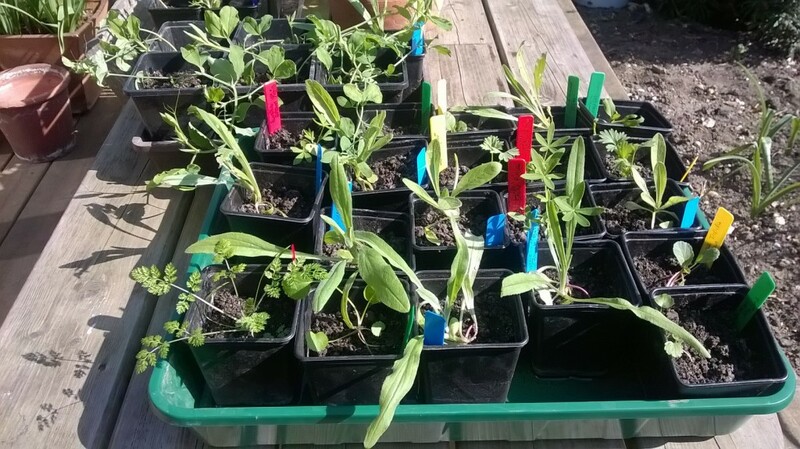 Growing in pots first also helps in the battle against slugs and snails which are rather partial to tender seedlings. Larger plants may suffer the odd nibble here and there but will generally stand a better chance of growing into a mature plant. If you do sow direct, you will probably need to add organic slug pellets or other slug defences such as a nematode treatment (which is watered onto the soil), copper slug rings or tape or wool pellets. I have tried the copper tape and nematodes this year as my son's favourite animals are snails (don't ask me why!) and I'm waiting to see if my seedlings are less nibbled. I may sneak in some organic snail pellets when he's not looking if I do see a problem. You only need to protect seedlings when they are small, once they are a fair size then you can stop using any pellets. If space is restricted in your garden you could try to mix annuals into your existing borders where you have any gaps and pick from there but ideally you will have a dedicated bed for cutting. This needs to be a sunny spot which is sheltered from the wind. With a cutting bed, you can treat the bed as a crop and cut with abandon without having to worry that your garden border looks ravished. I have 3 raised beds built from railway sleepers in which to sow (measuring 1.1 m x 2.2 m each) and a further smaller raised bed made from used wooden pallets (0.8m square) which I dedicate to cut flowers and bulbs. I find raised beds easy to work with as you can have a good depth of quality soil, deep enough that I can leave my bulbs and corms (Daffodils, Muscari, Anemone coronaria, Iris reticulata and Tulips) in the bed and plant annuals over the top of them. At the moment, I am waiting for the leaves on my daffs to die back but have planted my hardy annuals between bulbs or between rows. You don't walk on the beds so you won't have to dig them over in the Winter. Just a light forking and they are ready again. 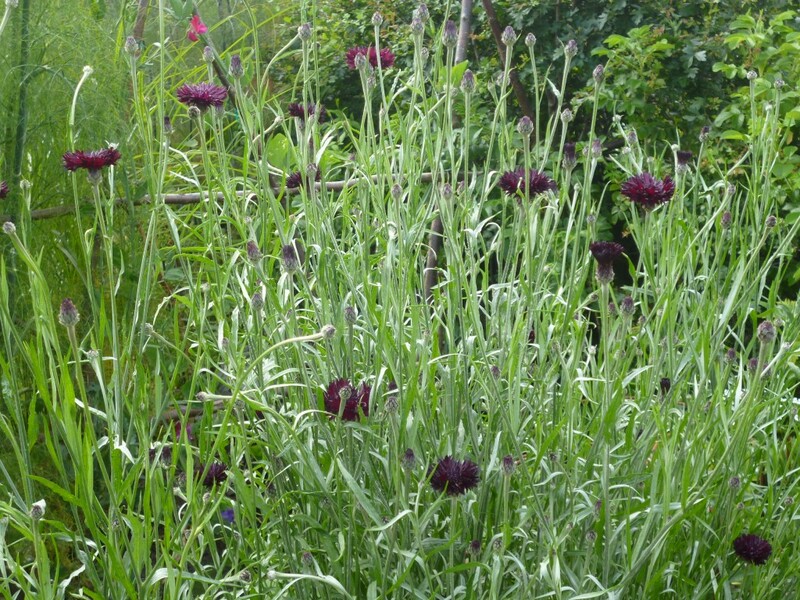 Cornflower 'Black Ball', my favourite Cornflower, in a raised bed in early Summer last year. It is late April now, but there is still time if you would like to sow your own cutting garden. 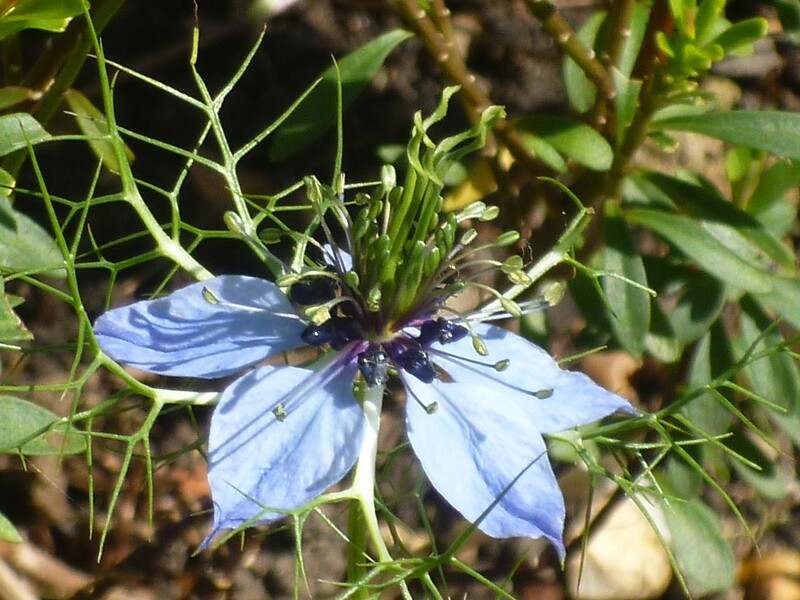 You can direct sow hardy annuals, such as Ammi majus and visigna, Bupleurum rotundifolium, Cornflowers, Nigella, Orlaya grandiflora, outside now. May- June is a good time to direct sow half-hardy annuals (those annuals that cannot withstand a frost such as Sunflowers, Zinnias and Cosmos ) or you can start them off now indoors to get a head-start. If you've completely missed the boat with sowing your seeds then you can buy small annual plug plants direct from nurseries and online retailers for planting out but this is less cost-effective. I forgot to sow any biennial Sweet rocket (Hesperis matronalis) last September so was really pleased to be able to buy a pot at a plant fair so I don't miss out on it's flowers in early Summer. 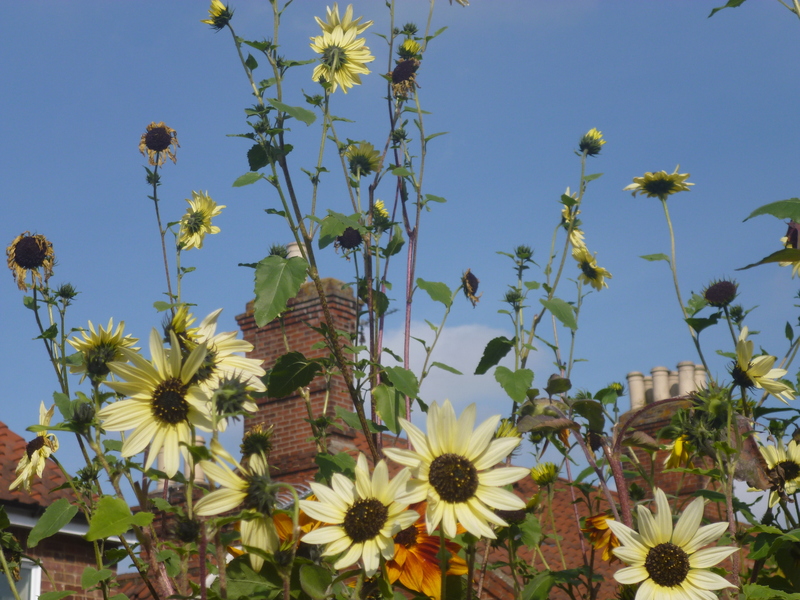 Half-hardy annual, multi-stemmed Sunflower 'Vanilla Ice' last Summer. The next stage in the story will be to plant out my half-hardy annuals (merrily growing away on the window sill) when all danger of frost is over - it's generally best to wait until the end of May to be on the safe side, and to stake all tall annuals well (a subject for a further post). I've focused on annuals as this is prime sowing time but I also use the rest of the garden borders to grow flowering perennials and shrubs which can be used for cutting. I would be lost without perennials like Knautia macedonica, Astrantia, Alchemilla mollis, & Galega offinalis and shrubs like Viburnum tinus and Daphne odora for their foliage and scented winter flowers. 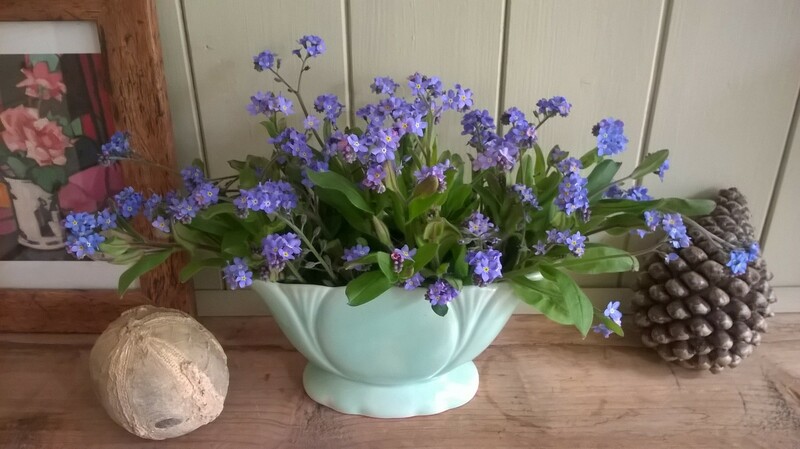 And I haven't even started on Summer flowering bulbs and tubers such as Alliums, Dahlias and Schizostylis..
Forget-me-nots in a pale blue Dartmouth mantle vase. What could be simpler? 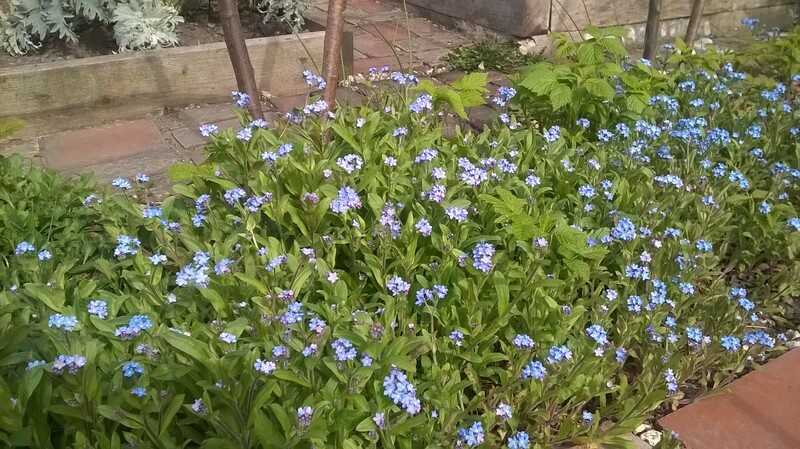 Once you have Forget-me-nots (Myosotis sylvatica) in the garden, you will never be without them as they are prolific self-seeders. They offer a great source of Spring colour in your garden borders and are versatile in a number of Spring flower arrangements, looking great with Primroses and Anemones. These simple pale-blue flowers have 5 petals with a yellow eye and appear from April - June above lance-shaped, grey-green leaves. They look good edging pathways or for under-planting Spring flowering bulbs such as Tulips or Daffodils. They will thrive in sun or partial shade and look lovely at the front of a mixed, herbaceous or wildflower border. There are many stories to explain the name 'Forget-me-not'. Legend has it that in medieval times, a knight and his lady were walking by a river. He picked a posy of flowers, but due to the weight of his armor he fell into the river. As he was drowning, he threw the posy to his lady love and shouted "Forget me not." It was often worn by women as a sign of faithfulness and enduring love. If you'd like to grow them in your borders, sow the seed directly where they are to grow in late spring or early summer. The soil should be well prepared and the seed sown thinly into shallow drills set 25 cm apart. When large enough to handle, thin the seedlings to 15cm. Maintain the soil moisture until the seeds have germinated, but avoid excessive waterlogging. Plants will flower in their second year and will self-seed freely. You can weed seedlings out where they are not wanted but you will want to grow lots of them for great arrangements throughout the Spring. I usually clear all spent plants once they are past their best and I still get lots more plants for the following year from the seed they will have produced.